The official name of this temple is Hojusan Risshaku-ji temple, but it is most commonly called Yamadera, which means “mountain temple”. Located in Yamagata in the Tohoku region, it was built in 860AD. This temple is the place where the haiku master Matsuo Basho composed the famous poem “Shizukasa ya/iwa ni shimi iru/semi no koe” (deep silence – the shrill of cicadas- seeps into rocks). The haiku was inscribed on a stone monument called Semizuka, built as a tribute to Basho. Buddhists monks are training in this mountain. This ascetic practice is called “Shugyo no Iwaba”( training of rocky area). The big rock is called Shakagamine and the area is closed to public. Kaizando and Godaido are two temple halls that are also observation decks. The wonderful view from those halls is not to be missed. 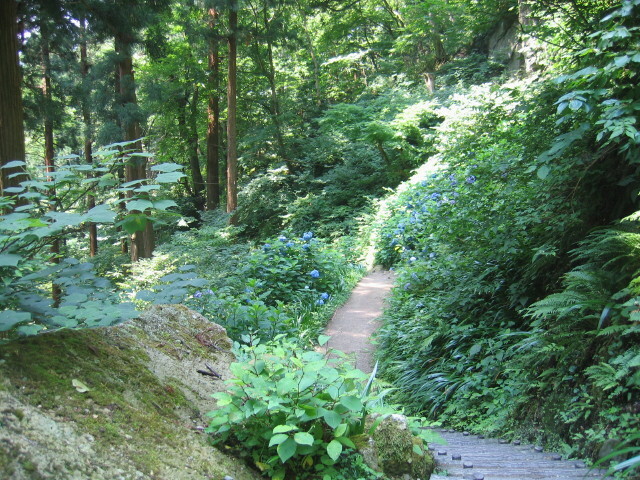 The Yonsun-michi is an old mountain path that has been used by the monks since a long time. The name “Yonsun” means a length of 4 “sun”, which equals approximately 14 cm. This name was given to the path because this is the width of the narrowest step. Follow the steps of Matsuo Basho and feel the spiritual atmosphere of this beautiful mountain temple.